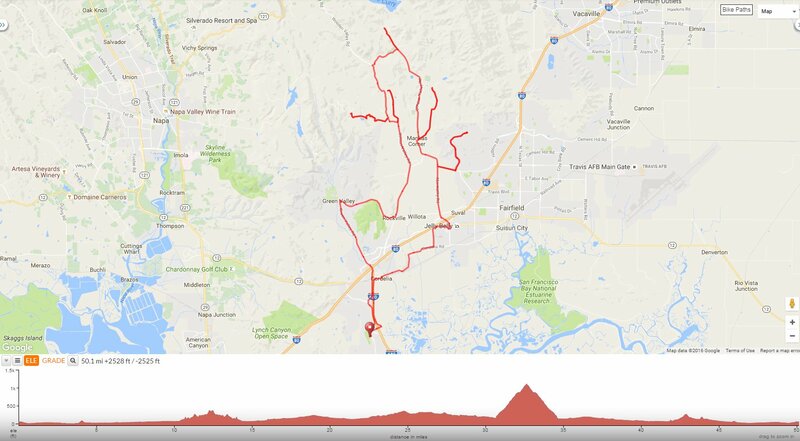 This ride meanders around Solano County along the scenic vineyards from Gordon Valley and Wooden Valley out to Suisun Valley and Green Valley. The route also explores several quiet dead-end roads located around the valleys with art sculptures and hilltop views. Begin this ride from Cordelia Community Park on Gold Hill Rd. Stay on Gold Hill Rd to Ramsey Rd; this frontage road goes along the east side of I-680 towards the I-80 junction in Cordelia. Go around the Budweiser plant on Hale Ranch Rd to Busch Dr and cross over I-80 on Chadbourne Rd to Abernathy. Abernathy Rd continues north through the agricultural farmlands and vineyards around Suisun Valley. Turn right on Mankas Corner Rd to Rancho Solano. Turn left on Rancho Solano Pkwy, it leads uphill through the upscale country club community at Rancho Solano Golf Course. Turn around and return to Mankas Corner Rd. Head north on Mankas Corner Rd, it leads you out-of-town along the flat open valley with views of the expansive acreage vineyards and olive groves. At Mankas Corner, turn right onto Clayton Rd. At the Gordon Valley Rd junction, stay on Clayton Rd for a flat out & back stretch through the valley farms and orchards. The road comes to a dead-end near the Solano County line. Turn around and make your way back to Gordon Valley Rd. Head north on Gordon Valley Rd through the rich agricultural farmlands and valley vineyards into Napa County. At the Wooden Valley Cross Rd junction, go straight to stay on Gordon Valley Rd. The road travels for an out & back stretch into the valley before coming to an end at City of Vallejo property-Lake Curry. Turn around and return to Wooden Valley Cross Rd. Continue on Wooden Valley Cross Rd; this road cuts through the valley vineyards under a canopy of trees to the T junction at Wooden Valley Rd. Turn left on Wooden Valley Rd, it steadily winds southward along the valley through the ranch lands and vineyards with beautiful hillside views. The road leads you back to into Solano County as it name changes to Suisun Valley Rd. It continues southward through the valley along Suisun Creek. Turn right onto Twins Sisters Rd, it turns westward for a challenging climb up to Suisun Reservoir and Twin Sisters Gun Club. This out & back road stretches two miles from the valley floor at 153 feet up to the end of the road at 1109 feet. It immediately kicks up towards the transmission towers with 9-12% grades. The road steadily climbs with steep grades along the scattered country estate homes near Sleepy Hollow Ln. The single land road continues winding uphill with super steep grades of 14-18%! Twin Sisters Rd eases to lesser grades as you approach the cattle crossing along the top of the ridge above Suisun Reservoir. The road climbs up through the woodland with 8-10% grades before coming to a dead end near Twin Sisters Gun Club. Turn around for the drop back down into Suisun Valley. Continue south on Suisun Valley Rd through the wineries and vineyards along Suisun Valley. As you go around the bend, turn left onto Williams Rd. The road travels northward for 1.4 miles through the valley orchards and farmlands. Check out the great mailbox sculptures along the valley! The road continues through the agricultural fields and farms. At the end of Williams Rd, you’ll encounter the collection of Glashoff art sculptures lining both sides of the road. Enjoy the wonderful free art display! More splendid metal sculptures scattered around the ranch. Enjoy the endless view of art! Turn around and return to Suisun Valley Rd. Continue rolling through the gorgeous Suisun Valley vineyards. Don’t miss the mailbox sculptures along the lower valley! The flat scenic valley miles leads you into the town of Rockville. Turn right onto Rockville Rd, it cuts westward across the valley with a low hill climb along the north edge of Rockville Hills Regional Park to Green Valley Rd. Head south on Green Valley Rd, you can either stay on the road or hop onto the multi-use trail. Green Valley Rd rolls through the residential subdivisions out to the I-80 overpass. The road name changes to Lopes Rd as you cross over the freeway into Cordelia. Return on Gold Hill Rd to Cordelia Community Park. This is a wonderful ride around some of the beautiful valleys of Solano County! You’ll enjoy the art sculptures on Williams Rd, the glorious hilltop views on Twins Sisters and the colorful autumn vines and orchards throughout the valleys! Weather: Sunny and cool. Temps ranged from the high 40’s to the high 50’s with NE winds. NANCY how do you keep doing this? Riding your bicycle all over the place and taking pictures.